Update: As of October 2013, the Maraseks still hadn't paid their bills. Instead, they filed for bankruptcy and came up with all sorts of reasons to delay it (e.g. trying to claim a bankruptcy judge had a conflict of interest). They'll probably die of old age without having paid one red cent to anyone. 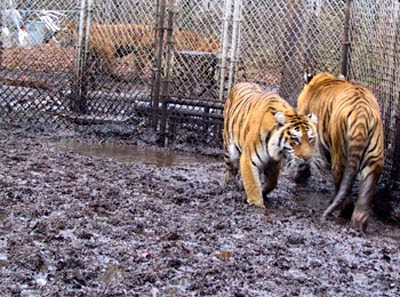 NEW JERSEY -- The Ocean County woman whose private tiger compound was shut down by the state last fall has been ordered to repay New Jersey the cost of relocating her 24 big cats to a Texas refuge. 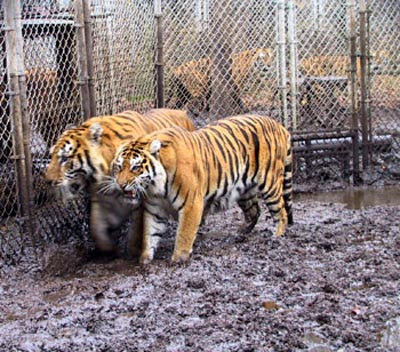 In November, the Department of Environmental Protection seized the Bengal tigers from the Tigers Only Preservation Society in Jackson and trucked them to San Antonio , ending a court battle over the cats that began in 1999. On Friday, Superior Court Judge Eugene D. Serpentelli ordered Joan Byron-Marasek and her husband to reimburse the state $144,555 in costs associated with moving the cats to the Wild Animal Orphanage in San Antonio . On behalf of the DEP’s Division of Fish and Wildlife, the state attorney general’s office argued the relocation broke the budget of the Non-game and Exotic Species Program, which handles inspections of zoos and similar facilities. 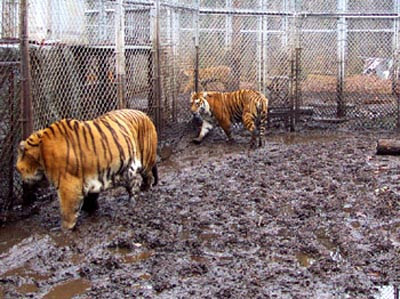 State officials said the tiger transfer cost a total of $290,000, which included the expense of building a facility at the San Antonio refuge to house the New Jersey tigers. The International Fund for Animal Welfare picked up part of the tab. State officials say they are prepared to place a lien on Byron-Marasek’s property if she does not reimburse the state for the expenses. 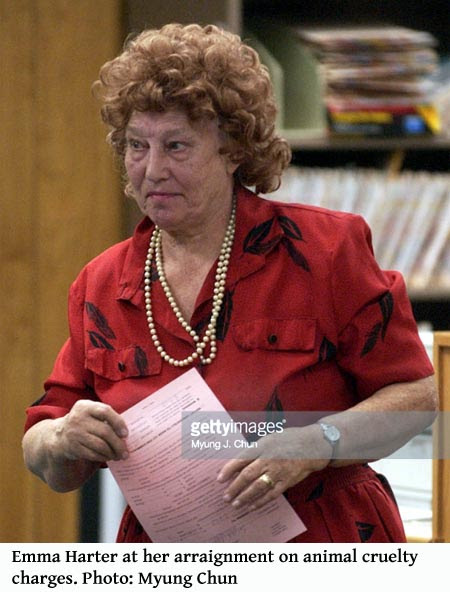 Byron-Marasek lost her permits for the cats after a 430-pound Bengal tiger was shot and killed when it was found roaming in Jackson in January 1999. She denied the tiger came from her 15-acre compound. 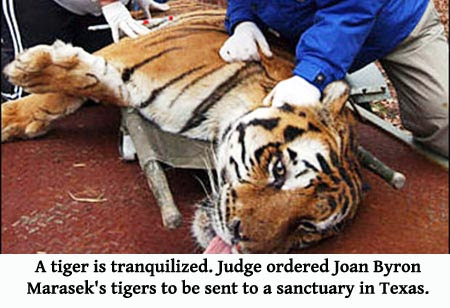 However, DNA tests on the tiger's fur matched tiger fur found inside her compound. 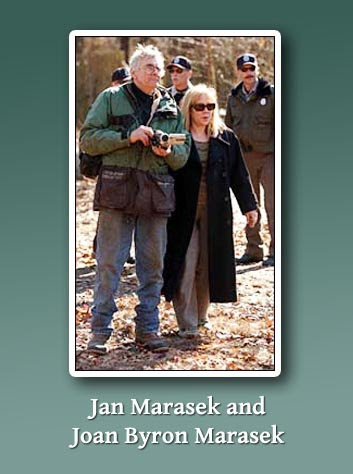 State officials subsequently inspected her compound and ruled it substandard, triggering four years of court wrangling. Byron-Marasek did not attend Friday’s hearing. However, she did submit legal briefs in which she argued the state wrongfully shut down her preserve. She disputed assertions the facility was substandard and alleged the state’s actions resulted from efforts to force her to sell her property, which lies within a commercially growing area just north of Interstate 195. CALIFORNIA -- A 72-year-old woman was taken away by ambulance after breaking into tears after her conviction for keeping more than 200 Chihuahuas in her Acton home that a prosecutor termed a "house of death and torture." Paramedics were called to the Antelope Valley Courthouse courtroom to check on Emma Harter, who began sobbing after the reading of the guilty verdicts on animal-cruelty and other charges, and then, after the jury was excused, laid her head down on a courtroom table and wept. "Miss Harter was very upset. Some medical personnel came and checked her," Deputy District Attorney Stephen Heller said. "She was clearly quite distressed." After Harter became distraught, the scheduling of her sentencing hearing was delayed until the afternoon. Harter did not appear at the afternoon hearing, and her attorney, Robert Conaway, said he had not been updated as to her condition, officials said. Judge Lisa Chung put over until Friday a decision on when Harter will be sentenced. Court officials said Harter was taken to a hospital but her condition was not available Tuesday afternoon. Harter, a retired school cafeteria manager, was found guilty of one count of felony animal cruelty, plus misdemeanor counts of failure to separate sick animals, keeping animals in unsanitary conditions, animal endangerment and battery on an animal control officer. Harter shoved a woman animal control officer out of her home's doorway in November 2002 when authorities came to inspect her five-acre property, prosecutors said. While the felony animal-cruelty count carries a possible prison sentence, Heller said he will not seek prison or jail for Harter. He said he will ask that she get counseling, be barred from owning animals and make restitution to Los Angeles County for the cost of keeping her dogs. "She clearly needs counseling," Heller said. "I personally don't believe she is able to admit to herself that what she did was wrong. It was a difficult case. She's an older lady; it raises some different issues." 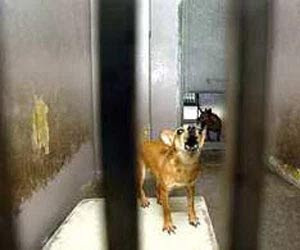 About 170 of Harter's Chihuahuas were kept at a county shelter in Baldwin Park at a cost estimated at $2,000 a day after they were taken by authorities from Harter in November 2002. The estimated cost to the county is more than $500,000, Heller said. Chung, who presided over the trial, in August gave a Burbank Chihuahua rescue group the 170 Chihuahuas, which county animal control officers described as half-wild. The rescue group promised to try to find good homes for the dogs. Lt. Sheri Koenig, who led the inspection of Harter's home, testified that she had never before seen such conditions. A video filmed by animal control officers as they entered the house showed dogs on tables and couches, soiled newspapers, dirty sheets, bloated ticks and feces. Outside, dead dogs were found in a freezer and shopping bags stuffed with dog carcasses littered the yard. Many of the dogs in the house were inbred and suffered severe behavioral problems, forming feral fighting packs, which regularly attacked, injured and killed other dogs. Several died or were euthanized after they were taken from Harter's home. Conaway said Harter raised Chihuahuas for 20 years, and that there is no limit on the number of dogs a commercial breeder can have. Jurors heard testimony from Harter's daughter, who testified that the home had been ransacked and that filth is a relative term. A veterinarian present during the impounding described the horrific conditions of the dogs. Conaway (Harter's attorney) called the vet's testimony unfair to his client because the bodies of dogs euthanized or found dead were disposed of before autopsies could be performed. "She testified and admitted they trashed the evidence of all the dead dogs," Conaway said. Harter was convicted in 1995 for operating an illegal kennel, but that conviction was overturned on appeal. Before the jury began deliberating, Heller dropped a second felony animal-cruelty charge as well as a misdemeanor charge of running an illegal kennel. Harter's dogs lived inside her house in what Heller described as squalor, an overwhelming stench, two to three inches of dried feces on the carpet, and "millions"of ticks crawling on the walls. Los Angeles County animal control officers said they found dozens of dead and dying dogs among the Chihuahuas in the house. The dogs had dug burrows in the walls and furniture and formed feral packs that preyed on weaker dogs, they said. Heller said Harter had 235 dogs and 61 birds when officers visited her home in November 2002. There were 32 dead animals, including 23 dogs and nine birds. Of the living dogs, 14 were "so severely medically impaired"that they were euthanized by county officials, Heller said. Heller said the dogs' ailments included anemia, bite wounds, tick infestation, respiratory infections, fluid on the brain, multiple types of worms, head and facial deformities, heart failure and tumors. Jurors began deliberating about 9 a.m. and returned with a verdict about 11:20 a.m. They spent part of the deliberation time viewing for the second time a 75-minute videotape made by Los Angeles County animal control officers of conditions at Harter's house. MISSOURI -- A Hendersonville, Tennessee, woman using a rented truck to haul more than 40 animals — some dead, some sick and dehydrated — was arrested yesterday near St. Louis. Evelyn Pool, 61, was charged with four counts of animal neglect. Pool was being held in Missouri in lieu of $15,000 bond. The animals were taken to a local animal shelter there. St. Genevieve County sheriff's officials stopped Pool about 11 a.m. after they received reports that her driving appeared to be impaired because of the load of animals. A horrid smell wafted from the cab of the rental truck, where there were 12 dogs of different sizes and breeds, said Capt. Mark Maples of the St. Genevieve Sheriff's Department. Deputies found more than 40 dogs, along with cats, rabbits and a pet rat, in the back of the truck. The animals had no food or water, and there were up to four dogs in one small cage, they said. 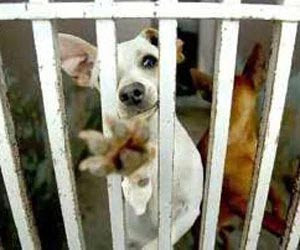 Several animals also were found dead in their cages, and one dog was found dead under the driver's seat of the vehicle. A Humane Society spokeswoman in St. Louis said it was not clear what Pool was doing with the animals. She told authorities she had been evicted in Tennessee and was driving to Nevada to find work. The St. Genevieve County prosecutor's office said animal abuse and neglect charges would be filed today. Pool left Tennessee a week ago after Hendersonville police arrested her daughter Christine Davis, 28, and charged her with two counts of child neglect. Police reportedly wanted Pool on similar charges. Those charges are the result of the discovery that the women and two children, 3 and 8, lived with garbage everywhere and no running water at 144 Glenn Hill Drive, police said. Police went to the women's home to serve an eviction notice, but the women were not there, said Hendersonville police Lt. Paul Harbsmeier. The officers found. Davis, who was later apprehended, has since been released from the Sumner County Jail on $1,000 bond. Davis' two children were taken into the custody of the Tennessee Department of Children's Services. • Franklin breeder Jennifer Siliski was indicted last week on animal cruelty charges after 230 purebred dogs and cats were taken from her home Jan. 22. • Nineteen cats were taken Janis Oberkirsch's home in La Vergne. She pleaded guilty in February to one count of animal cruelty. • William "Terry" Davis (William Davis, Terry Davis) of Murfreesboro was forced to surrender more than 90 cats in December. He faces 48 charges of animal cruelty. LOUISIANA -- A 66-year-old retired doctor is being held after more than 100 animals were found dead or neglected on her Lacombe property. Animal services found more than 100 dogs, 44 ponies and seven turtles on the property of Dr. Janis Walder. There were also dead animals in the yard. Walder's bail is set at $25,000. She faces 119-counts of animal cruelty, with more charges pending. "I've been trying all day to come up with words," said neighbor Wayne Childs. "It's almost indescribable." According to investigators, a deputy responded to the home on Tuesday to investigate a 911 hang-up call. What he saw led him to immediately contact animal control. "In twenty years as a veterinarian, I have never seen anything like this," said Dr. Brent Robbins, director of the St. Tammany Department of animal services. "Inside the property there were actually 55 dogs living inside the house. Outside, there were animals eating dogs that had died." Robbins said he is waiting for a judge to allow him to retrieve the ponies, which were kept on an isolated part of the property – so isolated that neighbors didn't even know about the horses. Neighbors said they made previous calls to the sheriff's office about the dogs and the smell. "It was so bad you couldn't come out of the house without gagging," Childs said. Animal services is asking the public for donations of supplies. Robbins said the animals also will eventually need homes. Re:"Dog hoarder has done it before, neighbors say," Metro, March 12.
the dogs at the animal shelter. situation. Once those animals were taken from her, she probably started again with one or two dogs, but the homeless, hungry and scared dogs kept arriving or she kept finding them on the street, in parking lots and other places where they had been abandoned. CALIFORNIA -- Trial opened Friday for a 72-year-old retired school cafeteria manager accused of animal cruelty for keeping more than 200 Chihuahuas at her Acton home. In his opening statement, the prosecutor described retired school cafeteria manager Emma Harter's home as a "house of death and torture." "This is a house where dogs were born, lived, suffered, unattended medically, and died," Deputy District Attorney Stephen Heller told jurors Friday. 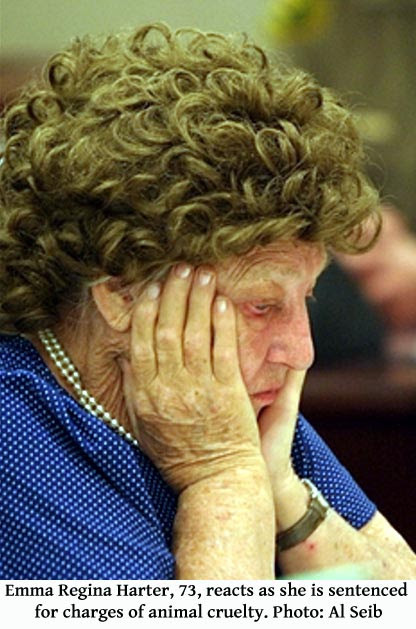 When animal-control officers inspected Harter's five-acre property in November 2002, they found dogs living in squalor, an overwhelming stench, two to three inches of "solid, packed, dried" feces on the carpet, and "millions" of ticks crawling on the wall, the prosecutor said. The charges include felonies for which the possible punishment is a prison sentence, but prosecutors have said they don't want Harter sent to prison but instead put on probation and banned from owning animals. Harter's attorney, Robert Conaway, urged the jurors to weigh what the laws require and not be swayed by the "emotional impact" of the prosecution's photographs depicting conditions at Harter's home. Some of the photos were staged by authorities, he said. "You will see dogs cornered in a room and photos were taken. This was a staged event for the purpose of producing the record that is going to be before you," Conaway said. Responding to the report on the amount of feces, Conaway said there are photographs that show carpet and "intermittent droppings." "Here's a person who opened her house to the dogs as part of the rearing process so that the dogs at some point could be sold," Conaway said. "Odor, yeah, kennels have odor. This is a breeding operation. This is a commercial kennel operation. Smell comes as part of that," Conaway said. "What you have here is a person who operated a kennel for a number of years. I believe the evidence will show there was no communication with animal control as to what she was expected to do differently," Conaway said. He told jurors they need to ask themselves whether there were specific laws violated. "Was food and water provided? Yes. Listen to what the law requires," Conaway said. Harter, who is free on her own recognizance, has pleaded not guilty to two felony animal-cruelty charges and misdemeanor battery on an animal- control officer, running an illegal kennel, animal endangerment, keeping animals in unsanitary conditions and failing to isolate sick animals. Los Angeles County animal-control officers said they found dead and dying dogs among packs of half-wild Chihuahuas living inside her house. The dogs had dug burrows in the walls and furniture and formed feral packs that preyed on weaker dogs. Heller said Harter had 235 dogs and 61 birds when officers conducted an inspection Nov. 18, 2002. There were 32 dead animals, including 23 dogs and nine birds, he said. There were 14 dogs "so severely medically impaired" that they were euthanized, Heller said. There was blood on the wall from ticks gorged on dogs' blood, Heller said. Heller said the dogs' ailments included anemia, bite wounds, tick infestation, respiratory infections, fluid on the brain, multiple types of worms, head and facial deformities, heart failure, and tumors. Judge Lisa Chung, who is presiding over the trial, in early August gave a Burbank Chihuahua rescue group some 170 Chihuahuas that were taken from Harter's home. 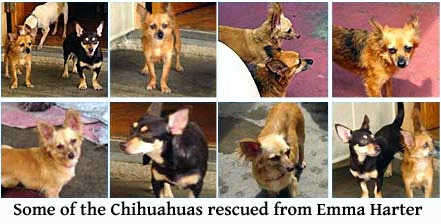 The rescue group promised to try to find good homes for the dogs. ILLINOIS -- A man accused of throwing his two pet cats out the 13th-floor window of his Near South Side apartment building was ordered held in lieu of $5,000 bail Tuesday. Booker Butler, 63, has been charged with felony aggravated animal cruelty after the cats fell to their deaths Monday from his apartment at 30 W. Cermak Rd., authorities said. Butler told police that each feline was on a window ledge as he "slapped the cat in the" posterior and "it went flying out the window," according to police. A witness reported seeing the cats fall 13 stories from a window ledge Monday morning. "He was told he couldn't have cats in the building. So his way of addressing the issue was to kill the cats," a police spokesman told the Chicago Tribune. Building management officials said the high-rise in the Chicago Housing Authority's Hilliard Homes complex is being vacated and Butler was told he would not be allowed to take the cats to a refurbished high-rise nearby. If convicted, Butler could face 1 to 3 years in prison. GEORGIA -- Thomaston Police Animal Control Officer Bobby Ellington will be out of work for at least another three weeks after having torn a muscle in his right leg Feb. 11 while capturing a vicious pit bull roaming loose on Avenue E.
"As soon as I can get back to work," Ellington said, "I'm going to talk to the chief and see what I can do about getting these fines for having vicious animals increased." The dog was destroyed last week after the owner, Gary Thornton, 116 Avenue E, failed to pick up the animal from the Upson County Animal Shelter. Also last Monday, Thornton was charged with violating city ordinances by having a dangerous animal and failure to show proof of rabies vaccination for the animal. Ellington, who has worked at the local department for 18 years, said although the dog incident happened more than two weeks ago, he just got off crutches last Wednesday. "I couldn't even walk at first," he said. "My quad muscle got torn in half and the doctors say there's not much they can do, that it'll just have to mend on it's own, but it sure does hurt." Council member Lila Bryan called police after her neighbor's pit bull escaped through a hole in a chain link fence. The dog attacked Ellington as he was captured it.